Friday 17. August 2018 - Labels give products their unique identity and boost the impulse to buy at the point of sale. Although the label market accounts for just five percent of the worldwide print volume of around EUR 400 billion, it has the biggest growth potential in the industry. This is because of the high demand for labels with unusual embellishments and just-in-time delivery. The annual growth in self-adhesive labels is over four percent, increasing to double digits for digital inkjet printing. Asia is now the fastest growing label market in the world with over 40 percent, followed by Europe with 25 percent and the USA with almost 20 percent. Heidelberger Druckmaschinen AG (Heidelberg) provides a comprehensive product portfolio with its subsidiary Gallus that supports label printers with digital and conventional machine systems for success in this promising market. The requirements of the label market are changing, with demand growing for more and more short runs and personalized or versioned labels. Reason enough for the Austrian company Insignis-Etiketten to establish a new business unit that has been offering new applications in digital printing since spring of this year with the Gallus Labelfire 340. “Flexo printing, screen printing, coating, and inkjet are brought together perfectly in this system, enabling us to produce a fully embellished and die-cut label,” confirms CEO Ferdinand Hager. This means that faster production with less waste is possible during digital printing of embellished labels. Insignis produces labels for the food and beverage, cosmetics, pharmaceutical, and industry market segments. “We save time, costs, and material and can also approach new clients in the agency sector to show the possibilities offered by personalization and versioning,” explains Hager. HUB Labels, based in Hagerstown, USA, has been a Gallus customer for many years in conventional label production. The company produces i.a. Premium labels for the Food, Beverage and HBA markets where the demand for short runs, with which brand producers can respond faster and more flexibly to current market trends, is growing. In the past, it was difficult for HUB labels to offer such jobs at a competitive price. That’s why the company decided on a Gallus Labelfire 340 digital label press: “The Labelfire enables us to reliably and repeatable produce high quality color consistent premium labels from run to run. This has allowed us to win numerous orders that we have had to leave to our competitors in the past, “said Thomas Dahbura President Hub Labels, Inc. Since its introduction, over 20 Gallus Labelfire 340 have already been sold. Customers have a high opinion of this machine, which combines the latest digital printing technologies with the benefits of conventional press and postpress technology. The new Gallus Smartfire was presented to the market for this first time at this year’s Gallus Innovation Days. The entry-level model for digital label printing produces a fully die-cut label, ready to ship on a roll, in a single pass. The visitors were impressed and the Smartfire immediately found buyers in Switzerland and Poland. 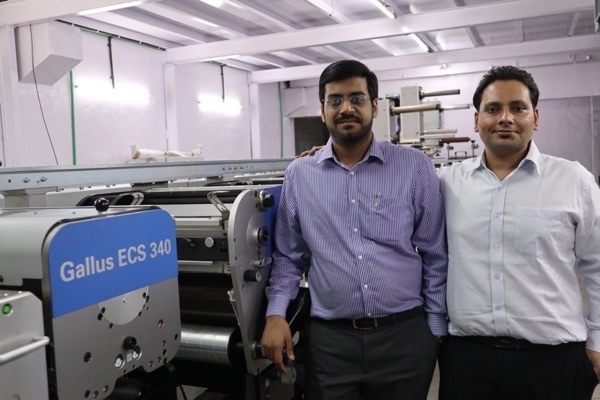 The Indian company Sonic Labels in Mumbai decided on a Gallus ECS 340. Founded seven years ago, the label printer serves the household, cosmetics, and industry market segments. “We want to offer our customers high-quality labels at low prices, with delivery within 48 hours. 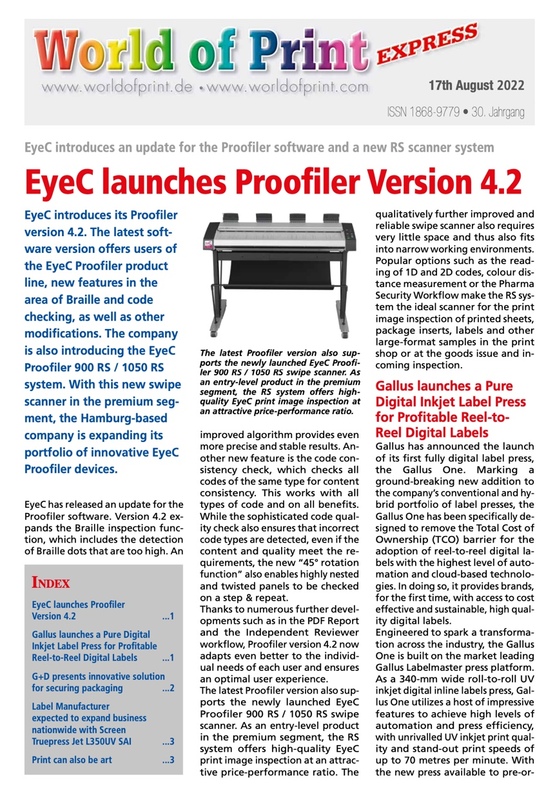 The Gallus ECS 340 lets us do this,” says Aditya Ojha, Head of Marketing and Design. The Gallus ECS 340 has been the most successful and highest selling label printing press in its class since its introduction in 2009. Nearly 500 machines have been sold worldwide. Heidelberg and Gallus are working intensively on new service offerings to promote digitization in businesses and offer customers a concrete added value. For example, the product “M-Call” offers automated ticket creation based on an autonomous process from the machine to the Gallus help desk that enables a faster response by the service team. Customers also benefit from the virtually completed integration of the Gallus sales and service organizations into the Heidelberg Group, which means they can take advantage of Heidelberg’s worldwide service network.